Filmed over three years in Venice, Nsukka, and the United States, this is a powerful portrait of Africa's most widely acclaimed contemporary artist El Anatsui. 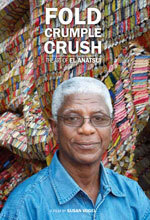 FOLD CRUMPLE CRUSH: THE ART OF EL ANATSUI gives an insider's view of the artist's practice, the ingenious steps and thousands of hours of labor that convert used bottle tops into huge, opulent wall hangings. Here Anatsui explains how his artworks have become a marriage of painting and sculpture, objects that speak of African history but also reach for the ethereal—and he talks about his aspirations for artworks he has yet to make. Behind the charming, easy-going artist we discover a man who remains mysterious even to his dearest friends. The film circles around Anatsui, drawing ever closer to a deep understanding of the man and his surprising bottle top hangings. We see the celebrated artist installing work on the great world stage of the Venice Biennale; we follow him back to the small town of Nsukka as he goes about his daily life, then watch him inside the hive of his studio directing assistants as they stitch together bottle tops into a vast metal hanging. Finally, Anatsui admits us to the privacy of his home where he tells us about his formative years, and reveals a youthful discovery that clouded his life. Accompanied by ANATSUI AT WORK: EIGHT SHORT FILMS. These elegant, instructive shorts depict Anatsui demonstrating his artistic process and discussing his theories on specific media as he creates one of his most ambitious works in Nsukka and installs it on the facade of the Palazzo Fortuny Museum in Venice. They are designed for use either as stand-alone statements, or as a 28-minute film. ANATSUI AT WORK, shot on three continents with FOLD CRUMPLE CRUSH, contains little duplication of the longer film aside from condensed sequences of the artist's studio. A swift instructive look at the artist El Anatsui demonstrating his process, and discussing his theories. Short but sweet look at the work of the renowned African artist whose photographs have documented social and cultural changes in Mali over a forty-year period.